Given the Axiom of Dependent Choice, the Axiom of Regularity in set theory is equivalent to the statement that there are no backwards infinite membership regresses, i.e., no cases where we have a backwards infinite sequence of sets ...,A−3,A−2,A−1,A-0, where each set is a member of the next. Why think this is true? Well, intuitively, a set depends on its members. That suggests that the reason to believe the Axiom of Regularity is that there cannot be an infinite dependency regress. And that in turn has all sorts of other consequences (including that there is a first cause). As I was thinking about causal finitism, the view that nothing can have an infinite causal past, I realized that there were structural similarities between the arguments for it on the basis of paradoxes like the Grim Reaper and Grandfather-like arguments against causal loops. And that led me to thinking whether there wasn't some way to generalize causal finitism so as to rule out both infinite causal pasts and causal loops. There is. Here is one way. Say that a causal nexus is a network of nodes with partial-causation arrows between them, such that there is an arrow A→B if and only if A is a partial cause of B (or causally prior to? I think that's the same thing, but I'm not sure; or, if there is such a thing, directly causally prior to). Say that a monotonic sequence in a causal nexus is a finite sequence A1,A2,...,An of nodes such that each node is joined with an arrow to the next: A1→A2→...→An. The sequence culminates in An. Note that if there are causal loops, then a monotonic sequence can contain the same node multiple times. No metaphysically possible causal nexus contains a node that is the culmination of infinitely many monotonic sequences. Infinite regresses: longer and longer monotonic sequences of distinct nodes culminating in a given node. Infinite cooperation: infinitely many arrows pointing to a single node (and hence infinitely many monotonic sequences of length two culminating in it). Causal loops: longer and longer repeating monotonic sequences culminate in a given node (e.g., A→B, B→A→B, A→B→A→B, ...). The possibility of handling infinite causal histories and causal loops--which I've long thought absurd--in the same framework makes me even more confident in causal finitism. One of my hobbies is computer science education for children. 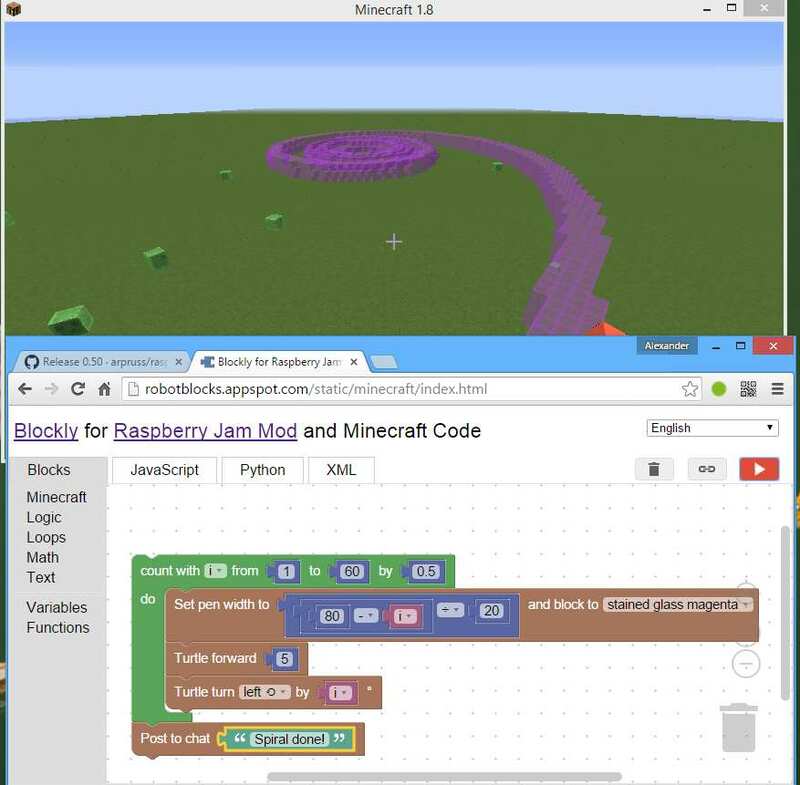 Over the past year or so, I've been developing Raspberry Jam Mod (requires Forge and Minecraft 1.8), a Minecraft mod that implements the Raspberry Pi Minecraft API and allows one to write Python code that connects with Minecraft (this isn't that original: there are two other projects that do that). I taught some Python to gifted middle- and high-schoolers in the summer using this setup. Over the last couple of days, I decided it would be nice to make something like this available for younger kids, using Google's Blockly graphical programming environment in place of Python. It's nothing very sophisticated, but you can use 3D turtle graphics commands to draw stuff in Minecraft. If interested, install Forge for Minecraft 1.8, then Raspberry Jam Mod version 0.50 or higher, start a single-user Minecraft world, and point your browser to robotblocks.appspot.com to get the Blockly code editor in-browser. The in-browser Blockly editor should then talk to your Minecraft. Source code for the Blockly stuff is here. The presentist can also insist that my line of thought is simply a case of the grounding problem for presentism, and can be resolved in a similar way. Supposing a window has just changed from being whole to being broken. Then while the past unbroken state doesn't exist, there does exist a present state of the window having been whole. I am happy to grant this present state to the presentist, but it doesn't affect the argument. For the relevant difference isn't between the window having been whole and the window being broken. For if no one broke the window, there would still have been a difference between the state of the window having been whole and the window being broken. There is always a difference between a state of something having been so and a state of its being so, but this difference isn't the difference that constitutes change. One of the main objections against Platonism is that it offends against Ockham's razor by positing a large number of fundamental entities. But the Platonist can give the following response: By positing these fundamental entities, I can reduce the number of fundamental predicates to one, namely instantiation. I don't need fundamental predicates like "... is charged" or "... loves ...". All I need is a single multigrade fundamental predicate "... instantiate(s) ...", and I can just reduce the claim that Jones is charged to the claim that Jones instantiates charge, and the Juliet loves Romeo to the claim that Julie and Romeo instantiates loving. In other words, the Platonist's offenses against Ockham's razor in respect of ontology are largely compensated for by a corresponding reduction of ideology. Largely, but so far not entirely. For the Platonist does need to introduce the "... instantiate(s) ..." predicate which the nominalist has no need for. On pain of a Bradley-type regress, the Platonist cannot handle that predicate using her general schema. I forgot to post an update earlier in the month that my and Josh Rasmussen's book manuscript Necessary Existence was sent off to the publisher for review. This book contains a bunch of arguments, some of them developed on this blog, others by Josh alone, some in correspondence by the two of us, all of which contend that there is at least one concrete necessary being, where an entity is concrete if and only if it is possible that it causes something. This is going to be very speculative, and I doubt it yields an orthodox account of transsubstantiation, but since there is some chance that it does yield such an account (and if it doesn't, we might get a deeper picture of transsubstantiation by thinking about why it fails), it's worth thinking about. Let's say, as a first approximation, that an object is white at a spacetime region U provided that the object has a direct causal power of reflecting light incident on U diffusely and approximately uniformly across the visible spectrum. Observe that in this definition nothing was said about U being a region that is occupied by the object. It is logically possible for an object to have a causal power of action at a spatial and/or temporal distance, thereby diffusely and approximately uniformly reflecting light incident on a region unoccupied by the object. Now suppose that a white piece of bread is going to be destroyed, but just before it is destroyed the causal power of whiteness that it has is enhanced to work at a temporal distance, thereby diffusely and approximately uniformly reflecting light incident on a spatial region shaped like a piece of bread in the future after the destruction of the piece of bread. Then there is a sense in which the whiteness of the piece of bread persists after the destruction of the piece of bread. It seems there are two senses in which we can say that the whiteness of an ordinary object is at a location V. One sense is that the relevant causal power is located at V and the other sense is that the object is directly causing light to be reflected whitely at V. The location of the accident of whiteness can be identified either with the location of the causal ground of the reflection or with the location of the immediate effect of that causal ground (the second matches how Aquinas understands the locations of angels: they are deemed present where they act). Normally, the two locations coincide or are very close together. So there is a a sense in which, in the scenario where the bread has the power of causing white reflections after its destruction, the accident of whiteness exists at the location where the reflection occurs, and hence continues to exist after the destruction of the bread. Thomas Aquinas's take on transsubstantiation supposes that the accidents of bread and wine can continue existing even after the bread and wine have perished, something that was heavily criticized by people like Jan Hus. But here is an argument for the possibility of an accident outliving its substance. Consider a very long rattlesnake, stretching out to maybe ten million kilometers in length. The rattlesnake is rattling for one second. The rattling of the tail is an accident of the rattlesnake, call this accident R. Then the snake is near-instantaneously destroyed, e.g., by a series of synchronized explosive charges. Well, near-instantaneously in one reference frame! This snake is long enough that there will be another reference frame in which the front half is destroyed 15 seconds before the back half is. In this reference frame, there will be a time when the rattling of the tail occurs even though the front half of the snake doesn't exist. But a snake whose front half has been destroyed is no longer existing. So in this reference frame the accident R exists even though the snake no longer does. Granted, in the case of the snake it is only true in some reference frames that the snake doesn't exist while R does, while in the Eucharist the persistence of the accidents past the demise of the bread and wine takes place in all reference frames. But once we have seen that the principle that accidents must be contemporaneous with their substance is not generally true, I think some wind is taken out of the objector's sails. B-theorists are often accused of destroying the reality of change. That's a false accusation. B-theorists may have a reductive theory of change (to change is nothing but to have a property at one time and lack it at another), but they no more deny the reality of change than people who have a reductive theory of bachelorhood (to be a bachelor is nothing but to be a never-married marriageable man) deny the reality of bachelorhood. However, there is a charge in the vicinity that does stick. While we B-theorists believe in the reality of change, there is an important sense in which we don't believe reality changes, since what is true simpliciter is always true simpliciter. Events don't become real or cease to be real. So we can say that we believe in the reality of change but not the change of reality. A standard case of goal-directed activity is where I pursue a goal because the goal is worth achieving either intrinsically or in light of further ends. But not all cases of goal-directed activity are like that. Imagine (there may well be something like it) a parking system for a car that uses a variety of sensors to generate on a screen an animated 2D overhead view of the car, nearby obstacles and the parking space, so that you can park the car simply by looking at the screen. After I got used to the system, instead of thinking about moving my car, I would be thinking of moving the little animated car on the screen, much as in a video game. I would thus engage in end-directed activity whose goal would be that the little animated car move into its on-screen parking spot. As a result of my engaging in this activity, the real car would move into the real parking spot. But note that the on-screen movement of the animated car isn't a means to the movement of the real car. Rather, it is my pursuit of the goal of the on-screen car moving into the on-screen spot that accomplishes the movement of the real car, and it is the movement of the real car, not the on-screen movement, that has the relevant value. Moreover, in this system I would accomplish the movement of the real car more effectively by not thinking about the real car, and only focusing my goal-directed reasoning on the on-screen car. This is a fancy example, but whenever we use computers such things happen. For instance, when you send an email on a non-touchscreen computer, you think about how to click an on-screen "Send" button. Your means to that is to move a pointer on the screen to the button (say, with a mouse) and to click. So you have as your goal the movement of a pointer on the screen to a particular rectangular area on the screen. But in fact the movement of a pointer on the screen to a rectangular area on the screen does nothing to accomplish the sending of the email. The actual means to the sending of the email is the changing of a pair of behind-the-scenes coordinate variables to values in the intervals corresponding to the coordinates of the "Send" button, followed by the pressing of the mouse button. But you don't think about the coordinate variables. You may not even not know that that's how the system works. You think about moving the little arrow on the screen. But the little arrow is only a helpful visualization of the two coordinates. If the screen turned off, or the software stopped updating the displayed arrow, but the underlying coordinate variables continued to track the mouse position, you'd still send the email (but it would be hard to aim). In this case, people accomplish the goal of sending the email by aiming to move the on-screen arrow rather than by aiming to change the underlying coordinate variables. The pursuit of the goal of moving the arrow helps you send the email, but the fulfillment of that goal does not. So we now have three kinds of goal-directed activity. In the first sort, the goal is pursued for its own sake. In the second, the goal is instrumentally valuable for the sake of something else. In the third, the one I want to think about, what is instrumentally valuable is not the goal that is being pursued but my pursuit of that goal. For it is the pursuit of that goal, rather than that goal itself, that promotes my further end. The third case is actually a pretty common phenomenon. In the two cases I gave above, the way this worked was that the achievement of a goal that had no relevant instrumental or ultimate value (the movement of an animated car or a pointer) was correlated with the achievement of another goal that was valuable instrumentally or not. Another kind of case is where the the focus is not so much on the achievement on the first goal, but where the focus is on the pursuit of it. Games develop all sorts of human excellences. Some of these excellences are developed precisely through the pursuit of victory. Striving to win a race or climb to the end of a route provides one with healthy physical exercise, develops some aspects of strength of will, etc. In these cases, it isn't so much the achievement of victory that is correlated with the valuable things, as it is the striving for victory that gives rise to the valuable things. Because of these considerations, it valuable for us to be able to set goals for ourselves, goals that are not otherwise valuable. The reasons why it is valuable that I have discussed so far are based in our cognitive and moral limitations. We can better focus on parking or clicking if we just think of moving the on-screen car or pointer. We are better motivated to exercise body or mind by pursuing victory (understood broadly to include non-competitive cases, like climbing to the end of a route or doing a jigsaw puzzle). I don't think all the goals achieved in this way, however, arise out of our limitations. For in the case of games, there are aesthetic goods that are achieved by the honorable pursuit of victory. (Note: some games have rules of honor that go beyond the rules adherence to which is logically necessary for one to count as having won rather than cheated.) The goods may be achieved whether or not one achieves victory, though they tend to be fuller when one does achieve victory. But, again, one may well be more effective--this may differ from game to game--at achieving these aesthetic goods when one's means-end reasoning isn't actually aiming at them, when one is aiming at victory (subject to side-constraints of honor, if applicable). Are these cases an exception to the idea that we always act for the sake of the good? In one sense they're not, since one pursues the goal because pursuit of the goal is valuable in some way. But these cases seem to be an exception to the idea that when we engage in goal-directed action, the goal must be instrumentally or intrinsically valuable. Well, maybe not. Maybe the way this works is as follows. You see that it would be good for you to pursue a certain innately largely valueless goal (say, moving a pointer to a rectangle on the screen, or climbing over a sequence of holds marked with pink tape). Because it would be good to pursue the goal, you use your normative power to adopt goals, and when you use that normative power on the goal, fulfillment of it becomes valuable (it becomes, perhaps, a constitutive part of the basic human good of achievement), in something like the way that when you use your normative power to make promises, actions incompatible with what is promised become disavaluable. Nonetheless, however, the focus with which you strive to fulfill the goal may legitimately be greater than would be explained by the good of achievement alone. For instance, suppose I need to park a car correctly in order to save a life (I am parking the dictator's car, and any scratch means death), and I have the parking system I described at the beginning of the post. To park well, I need to avoid distractions and focus on moving the little on-screen car into its on-screen parking spot. But the focus with which I should pursue this may exceed the focus that is legitimate simply for an instance of the good of achievement. I'm doing this to save a life after all, and so I should reject distractions from more minor goods which normally I should take into account. But I think when I reject distractions, I need to include among my reasons for rejecting the distractions not just the good of achievement, but the good of saving a life by parking correctly. Inference to best explanation is central to our epistemic lives. Aesthetic judgments about theories are central to inference to best explanation. Hence, aesthetic judgments are central to our epistemic lives. Thus we should be objectivists about at least a part of aesthetics. In the light of the brain damage resulting from football, it is a serious question whether it's morally permissible to participate in or support the sport at all. Still, one can make a case that there are human excellences that this sport provides a particularly good opportunity for (I am grateful to Dan Johnson for this point), and the brain damage is an unintended side-effect, so there might be a defense of the sport in general on the basis of the Principle of Double Effect. But I think it is particularly difficult to defend educational institutions supporting this sport among students. For the defining task of an educational institution is to develop the minds of the students. But brain damage harms the individual precisely in respect of mental functioning. And it is much harder for an organization to justify an activity that has among its side-effects serious harm to the goods pursuit of which defines the organization. Many Natural Law (NL) theorists center their exposition of NL around the concept of a basic good. They give lists of basic goods, such as: health, friendship, knowledge, religion, play, etc. The basic goods are incommensurable: each one provides a different aspect of fulfillment to the possessor. An NL theorist shouldn't, however, think of the theory as depending on the concept of a basic good. For the concept is a fishy one. The basic goods are types of goods. Types come at many levels of generality. There does not, however, appear to be a non-arbitrary level of generality at which we get the "basic goods". Let me explain. Here is a non-arbitrary level of generality: infima species of goods, types of good that there is no way of further subdividing into further subtypes that differ qua goods. Given NL's commitments about incommensurability, one might try to characterize an infima species of good as a type of good such that (a) instances of it are all commensurable and (b) it isn't a proper subtype of another type of good with that property. The basic goods are not infima species. For instance, knowledge can be subdivided into knowledge of necessary truths and knowledge of contingent truths, and we have incommensurability between the types. Knowledge of necessary truths can then be subdivided into mathematical knowledge and non-mathematical knowledge, and again there is incommensurability there. I suspect the infima species are going to be extremely specific, e.g., Smith's intellectual friendship with Kowalska focusing on fundamental political philosophy (and it will probably be more specific than that) or Jones's knowledge of Pythagoras' Theorem on the basis of proof P17 (again, further specificity may be called for). Here is another non-arbitrary level of generality: the highest genera. There might be just one highest genus, good. Or perhaps the highest genera are good of God and good of a creature. Or perhaps there is an infinite list of highest general but they are all instances of the schema good of N where N is a type of entity. But the basic goods are neither infima species nor highest genera. They fall at some level of generality in between. And there seems to me to be no non-arbitrary way to delineate them. The best approach might be this: the basic goods (for humans) are the highest genera that fall properly under good of a human. (So if the good of a human is a highest genus, then the basic goods are second-highest genera.) But I doubt that there is a non-arbitrary way to define the highest genera under good of a human. There are many ways of subdividing good of a human, and the traditional subdivisions into basic goods are just one of them. For instance, one might subdivide good of a human into good of a human not in relation to other persons and good of a human in relation to God and good of a human in relation to non-divine persons (and maybe one or more hybrid categories). Or one might subdivide it into intellectual good and non-intellectual good. Etc. Another option: an epistemic distinction. Perhaps the basic goods are the finest partition of the goods into genera with the property that one cannot fully grasp the distinctive value of any of the goods in any one genus on the basis of a grasp of the values of all the goods in the others. But I suspect that a distinction like this, if it can be made at all, would be liable to point to what is in at least some ways a finer level. Can one really grasp the distinctive value of aesthetic knowledge or friendship with Mother Teresa on the basis of other goods? Moreover, it may be that to grasp friendship one needs to grasp at least one other basic good, since friends promote each other's good not just in respect of friendship. Fortunately, while the notion of incommensurable goods is important to NL, I do not think the NL theorist really needs a non-arbitrary concept of a basic good. The lists of basic goods are useful as heuristics, and they are a pedagogically valuable way to illustrate incommensurability. Moreover, it may be practically useful for guiding one's decisions and self-examination to have a division of goods that is sufficiently thick but not too fine-grained. Plausibly, a belief that p is justified only if one has good evidence that p. But what about a case where instead of having evidence for a belief, one has evidence that if one believes it, then it's be true? (I'll call this the Belief Conditional.) For instance, tonight Sam will decide whether to watch Battlestar Galactica or Deep Space Nine. But Sam hates being shown to be wrong. So if she now comes to believe that she will watch, say, DS9, then come evening she will watch, say, DS9 in order to make her earlier belief true. She knows all this. She also hates suspending judgment. So she makes herself believe that she will watch DS9. (She's not deciding what she is to watch. The decision will come tonight.) Once she realizes that she has succeeding in coming to the belief that she will watch DS9, she has evidence that she will watch DS9. But we may suppose that there is a short period of time during which Sam hasn't yet realized that she believes she will watch DS9. During that short period of time, she doesn't have evidence that she will watch it. Instead, she just knows the conditional that if she believes she will watch it, she will watch it. I am inclined to think that Sam's belief that she will watch DS9 is reasonable and justified. But I am not happy to extend this to a general claim that having justification for a Belief Conditional suffices for justification of unconditional belief. Here's a case that worries me. Suppose that having read a lot of papers defending an error theory about folk psychology, and generally hanging about in unfortunate philosophical company, Fred is in possession of strong evidence that nobody believes anything. But despite the evidence, ingrained habits make Fred continue to believe that someone believes something. (I take it for granted that the error theory is mistaken.) Of course, Fred does know the obvious necessary truth that if he believes that someone believes something, then someone believes something. But nonetheless given the evidence against folk psychology, I am inclined to think that Fred isn't justified in believing that somebody believes something. I don't know how to distinguish the cases of Sam and Fred. I feel pulled to assimilate one to the other, but I don't know which I should assimilate to which. Say that a sequence of events is per se causally ordered provided that each event not only causes the next but also causes everything in the next that is involved in causing the one after that (if there is one after that). Any possible chunk of contingent reality is such that it is possible for something internally just like it to have a cause. It is not possible to have a cause for an infinite per se causal regress of contingent causes. Anything internally just like an infinite per se causal regress of contingent causes is an infinite per se causal regress of contingent causes. So an infinite per se causal regress of contingent causes is impossible. In the argument, (1) is a weak causal principle. The reason for the "something internally just like" phrase is that without the phrase the premise would immediately imply that every possible chunk of contingent reality has a cause given essentiality of origins. Premise (3) requires a non-Humean account of causation. I am going to ignore metaphysical questions about chunks of reality: perhaps we can reformulate in terms of pluralities, perhaps in terms of sets. A crucial controversial premise is (2). Here's an intuitive line of thought that inclines me to (2). Suppose we have a backwards-infinite per se causal sequence of chickens and eggs, each chicken fully deterministically causing an egg with all of its relevant causal power, and each egg deterministically causing a chicken with all of its relevant causal power. And imagine this regress has a cause, say, G. How can G cause that whole sequence? Well, it couldn't do it by causing one particular chicken or one particular egg, for that wouldn't account for the chickens and eggs that came before that. The only picture I get of how something could cause the whole sequence would be if it caused each one of the eggs and chickens, or each one prior to some point in time, or more generally some backwards-infinite subsequence. The argument will be the same in each of the three cases, so I will just focus on the simplest. So the cause G caused each of the eggs and chickens, and thereby caused the sequence. But of course each egg is caused by a chicken, too. So a given egg has two causes: it is caused by a chicken and by G. But the chicken caused the egg fully, with everything the egg needed to do its job of causing the next thing. So what did G contribute? Nothing really crucial to the sequence, since everything crucial to it was contributed by the chicken. Rather, it looks like it's going to be a case of overdetermination. The egg is caused by G and it's caused by the chicken. But G's causing of the regress as a whole isn't overdetermined (or so we may surely assume, modulo some technicalities), since in the absence of G the whole sequence wouldn't be caused. And if you take away a non-overdetermining cause, the effect disappears. So if you took away G, the whole regress should disappear. But why should taking away G matter, given that all of the causal influences by which G allegedly causes the regress are individually overdetermined? If this is all right, then the critical attention will shift to (1). The state of the lamp at 1 pm would not be affected by shifting the times at which the button presses happen, if (a) all the button presses happen between noon and 1 pm, and (b) we ensure that no two button presses happen simultaneously. If we removed one button press from the sequence of button presses between noon and 1 pm, the state of the lamp at 1 pm would not change. Given this intuition, we do have a problem. Suppose that our sequence of supertask button presses occurs at 12:30, 12:45, 12:52.5, and so on. Then shift this sequence of button presses forward in time, so that now the sequence is at 12:45, 12:52.5, 12:45.25,and so on. By (1) this wouldn't affect the outcome, but by (2) it would as we will have gotten rid of the first button press. That's a contradiction. So if we think Thomson's lamp is possible--which I do not--we need to deny at least one of the two counterfactuals. I think the best move would be simply to deny both (1) and (2), on the grounds that the connection between the state of the lamp at 1 pm and the button presses must be indeterministic. each ticket has zero or infinitesimal chance of winning. Let's stipulate that a lottery is "paradoxical" if and only if it satisfies (1) and (2). Suppose now that a past-infinite causal sequence is possible (e.g., my being caused by my parents, their being caused by theirs, and so on ad infinitum). Then the following past-infinite causal sequence is surely possible as well. There is a machine that has always been on an infinite line with positions marked with integers: ...,-3,-2,-1,0,1,2,3,.... Each day, the machine has tossed a fair coin. If the coin was heads, it moved one position to the right on the line (e.g., from 2 to 3) and if it was tails, one position to the left (e.g., from 0 to -1). The machine moved in no other way. So if past-infinite causal sequences are possible, paradoxical lotteries are as well. But paradoxical lotteries are not possible, I say. So past-infinite causal sequences are not possible. So there is an uncaused cause. It is plausible that we have duties of conscience arising from inculpable mistakes about what we should do. I shall assume this and argue that culpable mistakes also yield duties of conscience. Fred hires a neurologist to brainwash him into a state which will make him think the next day that it is his duty to embezzle money from his employer. The neurologist succeeds. The next day Fred conscientiously believes he has a duty to embezzle money from his employer. But he refrains from doing so out of fear of being caught. Sally hires a neurologist to brainwash her into which will make him think the next day that it is her duty to embezzle money from her employer. The neurologist fails. But that night, completely coincidentally, a rogue neurologist breaks into her home and while she's sleeping successfully brainwashes her into that very state the first neurologist failed to brainwash her into. The next day Sally conscientiously believes she has a duty to embezzle money from her employer. But she refrains from doing so out of fear of being caught. There are no further relevant differences between Sally's case and Fred's. Fred is responsible for his conscience being mistaken. Sally is not responsible for that. Granted, Sally is culpable for trying to make her conscience be mistaken, but she is no more responsible for the mistaken conscience than the attempted murderer is responsible when her intended victim is coincidentally killed by someone else. If inculpably mistaken conscience gives rise to duties, Sally has a duty of conscience to embezzle, and she fails in her duty. She thus acted immorally on both days: on the first day she acted immorally by asking to be brainwashed and on the second day she acted immorally by refusing to obey her conscience. If culpably mistaken conscience does not give rise to duties, then Fred has not violated a duty of conscience by refraining from embezzling, while Sally has. If culpably mistaken conscience does not give rise to duties, then Sally is in a morally worse state than Fred, being guilty of two things while Fred is only guilty of one. If Sally has violated a duty of conscience by refraining from embezzling, so has Fred. Culpably mistaken conscience gives rise to duties. Of course all of this argument was predicated on the assumption that inculpably mistaken conscience gives rise to duties, and perhaps a reader may want to now revisit that assumption. But I think the assumption is true, leaving us with the conclusion that mistaken conscience gives rise to duties whether or not the mistake is culpable. Now let's turn the case about. Suppose that both Fred and Sally follow their respective mistaken consciences and therefore embezzle. What should we say? Should we say that they did nothing wrong? It seems we shouldn't say that they did nothing wrong, for if they did nothing wrong then their consciences weren't mistaken, which they were. So let's accept (though I have a long-shot idea that I've talked about elsewhere that might get out of this) that they both did wrong. Thus, as in Mark Murphy's account of conscience, they were in the unhappy position that whatever they did would be wrong: by embezzling they defraud their employer and by not embezzling they violate their conscience. But what about their culpability? Since Sally's case is one of inculpable ignorance, we have to say that Sally is not culpable for the embezzlement. Let's further suppose Sally and Fred's reasons for having themselves brainwashed were to get themselves to embezzle. Thus Sally is guilty of entering on a course of action intended to lead to embezzlement--basically, attempted embezzlement. But she's not guilty of embezzlement. What about Fred? He is certainly responsible for the embezzlement: it was intentionally caused by his immoral action of hiring the neurologist. But I am inclined to think that this is an effect-responsibility ("liability" is a good word) rather than action-culpability. Fred is responsible for the embezzlement in the way that one is responsible for the intended effects of one's culpable actions, in this case the action of hiring a brainwasher, but he isn't culpable for it in the central sense of culpability. (Compare: Suppose that instead of hiring a neurologist to brainwash himself, he hired the second brainwasher in Sally's case. Then Fred wouldn't be action-culpable for Sally's embezzlement, since one is only action-culpable for what one does, but only responsible for her embezzlement as an intended effect of his action.) Sally lacks that responsibility for the effect--the embezzlement--because her plan to get herself to embezzle the money failed as the embezzlement was caused by the rogue neurologist. In terms of moral culpability for their actions, in the modified case where they conscientiously embezzle, Fred and Sally are, I think, exactly on par. Each is morally culpable precisely for hiring the neurologist, and that's all. That may seem like it gets them off the hook too easily, but it does not: they did something very bad in hiring the brainwasher. So, if I'm right, they are on par if they both conscientiously embezzle and they are on par if they both violate their consciences by refusing to embezzle.